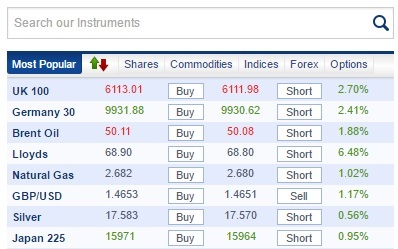 Plus500.com allows you to trade CFDs in the UK’s main index (FTSE 100). A trader with a Plus500 account can trade CFDs on Forex, Stocks, Commodities, Options, Cryptocurrencies and Indices. Plus500 provide online tools and download options to help you monitor and manage your trades, with automatic withdrawal options to help prevent losses. As with all online trading sites, your capital may be at risk when you trade online so please read our buying guide for more information. Unlike many other brokers, Plus500 also don’t charge commission on trades. The free demo allows you to try your hand at trading without the risk. If you’re new to online trading, you might wish to consider the free demo offered by Plus500. The free demo allows you to try your hand at trading without the risk. The service provides a simple user interface which allows you to monitor and manage your trades. You can view your trades, buy and sell prices, overall highs and lows, and graphs which provide a visual guide to trades over time. You can also check out open and closed positions, and your future orders. If you think you’re doing well using the demo version, you can easily switch to a real-money account and convert your virtual trades to real credit. Of course, it’s important to be aware that this conversion could result in monetary losses, but that’s the nature of online trading. Trade in a wide range of options without paying commission. If you’re looking to trade in a wide range of options without paying commission, Plus500 might be the website for you. Plus500 allows you to tade CFDs in various underlying products, including Forex, Stocks, Commodities, Options, Indices and Cryptocurrencies, all with 0% commission. If you’re not sure what this involves, the website also provides useful demonstration videos so you can better understand trading and the tools available to you. The fact that Plus500 don’t charge commission can save you up to 0.5% when compared with other trading websites, which may not sound a lot but it can really add up if you’re trading regularly. If you’re not quite sure what to trade in, the website provides a “most popular” list on its homepage. You can search through the instruments available or just consider the most popular trades. The simple layout allows you to quickly find shares and commodities which are performing well, and to quickly trade before the tides turn. 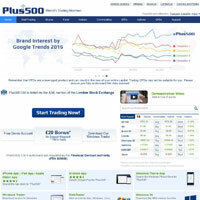 The Plus500 trading platform is offered by Plus500UK Ltd. The company offices are located in the city of London, UK, and it is authorised and regulated by the Financial Conduct Authority (FCA), FRN 509909, to offer Contracts For Difference (CFD). If you open an account, Plus500UK Ltd. will hold your funds on a segregated basis, in accordance with the Financial Conduct Authority's client money rules. Plus500UK Ltd. is a subsidiary of Plus500 Ltd. The parent company is headquartered in Haifa, Israel, and listed on the Main Market of the London Stock Exchange. Such internationally recognised regulation should offer considerable reassurance to prospective clients. Plus500 uses a single trading platform across a range of devices, meaning you won’t need to learn how to use a different platform when switching from one device to another. It is a versatile system, and you can choose to use the online tools or download the platform for your device, to help you to trade from the office or on the move. Apps are available for android devices, iPhones, iPad and more. Plus500 is one of the highest rated CFD trading apps on Apple's App Store and on Google Play. It also includes CFDs on popular financial instruments. You can also download their investment platform for Windows (including Windows 10) for a smooth operation with greater levels of management control. They’ve taken care over their software, making sure that each download is appropriate for the device it is being used on. The well-designed user interface shows updated information in a quick and easy snapshot, with toolbars which allow you to move smoothly between instruments. You can easily perform a new search, view trends and prices over time, or find more information about a particular trade. In addition to all those features we’ve already discussed, there are a lot of different markets to trade in via Plus500, so let’s examine a few of your options. You can trade CFDs in shares from 20 different global markets including those from the USA, UK, France, Germany and more. 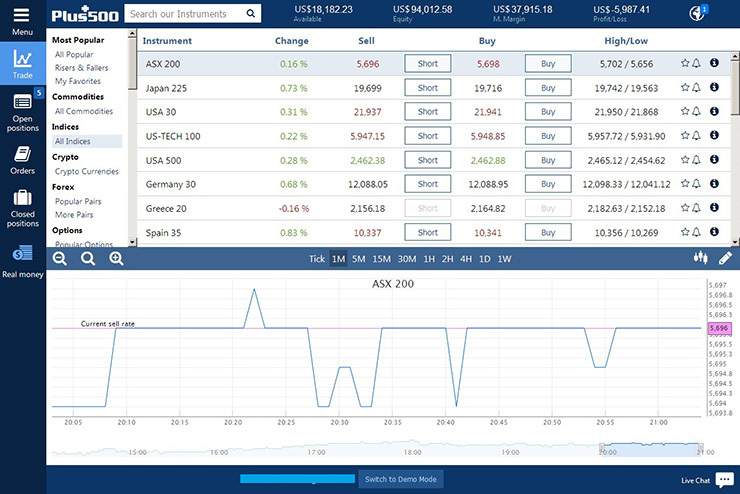 You can also view real time quotes from each market, allowing you to make quick decisions on whether to buy or sell. Thankfully, there are also no exchange fees, which can result in saving 0.5% when compared to some other share purchase options. 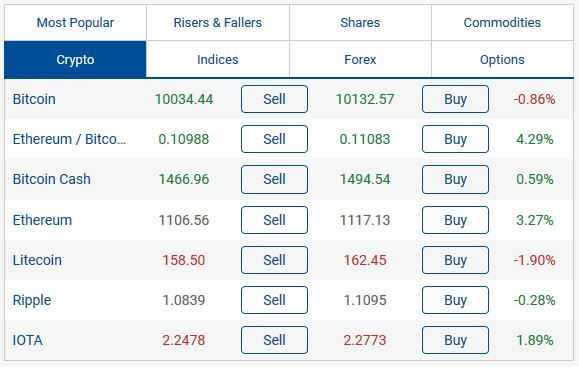 Plus500 is also keen to provide leverage to their users, meaning that small trades can adopt the effects of trading with higher amounts, so you can earn (or lose) capital based on market trends in areas you might otherwise not have enough money to trade in. Finally, you can set price limits, allowing you to automatically buy or sell depending on your profit and loss limits. Tight spreads between sell and buy prices and no commission charges may limit your losses on Forex (currency exchange). The Plus500 free trading platform also allows you to keep a close eye on your profit/loss settings, with professional graphs and an overview of currency pairs. Again, leverage is important here, and you can take advantage of some very competitive leverages, meaning small trades can take advantage of trading figures on larger capitals. As with other trades on Plus500, you won’t be charged commission for indices trades. Leverage on indices is extremely competitive (please refer to the Plus500 website for the latest values) and the rates are continually updated so you can make informed trading decisions. Graphs show short and long term analysis. As it is quick and easy to add and remove account credit, you can trade as soon as you spot a positive trend. Trade CFDs in the most popular commodities: oil, gold and silver with competitive leverages and trades starting at just £100. You can set your buy and sell positions to prevent large losses when your values are met. The commodities list on Plus500.com is probably the most limited of its trading categories, though, so if you plan on primarily trading in commodities then you might wish to look around at the range available elsewhere before deciding what's best for you. A set of online trading tools, including profit/loss limit settings, allow you to trade in a variety of ETFs (Exchange Traded Funds), which essentially provide you with a way of trading in commodity price fluctuations without having to make a direct trade in futures contracts. Again, the minimum trade is just £100. A flexible trading option with access to Dax 30, MIB 40, S&P500, CAC 40 and AEX 25 markets, with tight spreads on buy and sell prices. You can deal on sideways markets with instant rates which regularly update. Plus500 allows you to trade CFDs in the world's most popular cryptocurrencies with 24/7 availability (excluding Sundays at 12:00-14:00 UTC). The cryptocurrencies available include Bitcoin, Ethereum / Bitcoin, Bitcoin Cash, Ethereum, Litecoin, Ripple and IOTA, all of which can be traded with leverage (please refer to the Plus500 website for the latest leverage values). Cryptocurrencies can be extremely volatile, giving traders the ability to make significant gains (and losses) over relatively short periods of time. Plus500 will help you manage your risks by giving you access to various tools, such as Price Alerts and Stops, such as Stop Loss and Trailing Stop. Trade at a quoted price, and see how your trade progresses over time. A detailed account of CFD trading is provided on the Plus500 website and they clearly outline the potential risks of loss. In addition, you can read articles on risk management and utilise the site’s financial tools to monitor your CFD trades. You can explore popular shares, or shares specific to a particular country, or investigate the CFD lists for commodities, indices, Forex, options and ETFs (Exchange Traded Funds). CFDs have become very popular in recent years. As explained in the useful "Help" section on Plus500 the website, with CFDs, you get all the perks of having a stock, index, ETF, forex or commodity position without needing to physically own the underlying financial instrument itself. With CFDs, you get all the perks of having a stock, index, ETF, forex or commodity position without needing to physically own the underlying financial instrument itself. So rather than buying 1,000 Apple shares from a stockbroker, a customer could buy a 1,000 CFDs of Apple on the Plus500 Trading Platform. A $7 per share fall in the price of Apple would give the CFD customer a $7,000 loss, while a $7 per share rise in the price of Apple would give the CFD customer a $7,000 profit, in the same way as if he/she had bought the actual shares that are traded on the Exchange. With Plus500.com's CFD service, there are no Exchange charges and no Stamp Duty. According to Plus500, "the costs and delays of physical delivery of the shares, their registration and any holding or safe custody charges made by a broker are all avoided." Another benefit of CFD trading is that customers can trade a portfolio of indices, commodities or shares without having to commit a lot of capital. For example, a customer purchasing $70,000 worth of shares will only be asked for $7,000 initial margin for the equivalent CFD portfolio. With user-friendly online and downloadable platforms for a range of devices, demo accounts and superior customer support, Plus500 is our recommended choice for those wishing to trade CFDs. Its sheer range of markets makes it a flexible service wherein you can practice your trading decisions before adding real credit to your account. Plus500 doesn’t charge commission (though some other fees may apply, such as if you leave your account inactive for 3 months). Its automatic buy and sell features also mean that you can better reduce the risks of losses whilst capitalising on potential gains. If you’re thinking of exploring online trading options, Plus500 is a really great place to start.